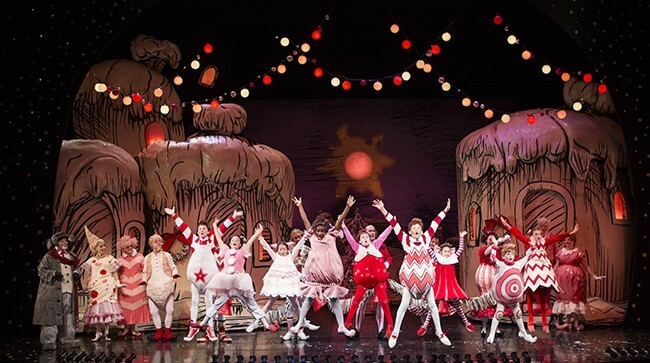 Seen opening night Nov. 20, the 17th annual production has become tradition — a perpetual gift to San Diego and San Diegans — just as envisioned by Dr. Seuss’ widow, Audrey Geisel, and then-Globe Artistic Director Jack O’Brien, who conceived and directed the first production here. Those who attended O’Brien’s presentation of the concept will never forget his enthusiasm as he described the Whos, Whoville and John Lee Beatty and Robert Morgan’s original scenic and costume designs. Other than slight tweaks to music and choreography, nothing much has changed. 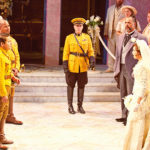 James Vásquez, who has staged it since 2003, currently directs the work. Generations of young San Diegans have seen the show, pointed at the stage, and said, “I want to do that,” and they have, giving rise to legions of singing, dancing youth who enrich the local scene, then spread out, along with their younger brothers and sisters. 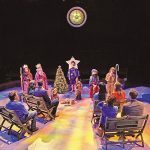 “Grinch” utilizes two teams of youngsters (Pink and Red), who alternate performances as Little Whos, Teen Whos, and name-role Whos. On opening night, 8-year-old Taylor Coleman portrayed Cindy-Lou Who for the second year, alternating with Gabriella Dimmick, also a repeat Cindy-Lou. 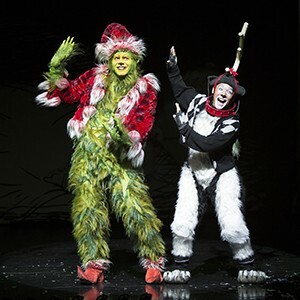 Burke Moses, a Broadway star with impressive and numerous hunky credits, makes his debut as the Grinch, providing a musically fine, intentionally gauche green guy, whose conversion from heartless Christmas hater to who-man-being is exceptionally touching. This season’s adult company is chock full of familiar and favorite Southern California singer/actors, some debuting in the show and others returning. 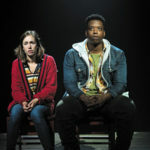 For instance, Robert J. Townsend (seen most recently as the father in San Diego Musical Theatre’s “Next to Normal”) makes his debut as Papa Who opposite Bets Malone (her second year as Mama Who). Jill Townsend, Robert’s wife and a formidable presence in any company, is among the six Grown Up Whos. Geno Carr and his wife Nancy Snow Carr portray Grandpa and Grandma Who, and extreme veteran Steve Gunderson returns to the show for his 12th year, this time as Old Max, the Grinch’s dog. Old Max returns to Mt. Crumpit to say farewell before he leaves. He relates the story of Young Max (Jeffrey Schecter) and how he abetted the Grinch in his attempt to steal Christmas. Elan McMahan, resident music director at Vista’s Moonlight Stage Productions, conducts the 8-member Who-Chestra, all represented by the American Federation of Musicians of the United States and Canada. 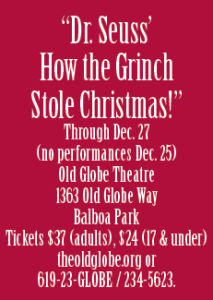 With book and lyrics by Timothy Mason and music by Mel Marvin, the show features “You’re a Mean One, Mr. Grinch,” the vaudeville number “One of a Kind,” and Cindy Lou’s heart-stopping “Santa for a Day,” sung by the little girl who catches the Grinch stealing her family’s Christmas everything and innocently believes him to be St. Nick. —Charlene Baldridge has been writing about the arts since 1979. Her book “San Diego, Jewel of the California Coast” (Northland Publishing) is currently available in bookstores. She can be reached at charb81@gmail.com.